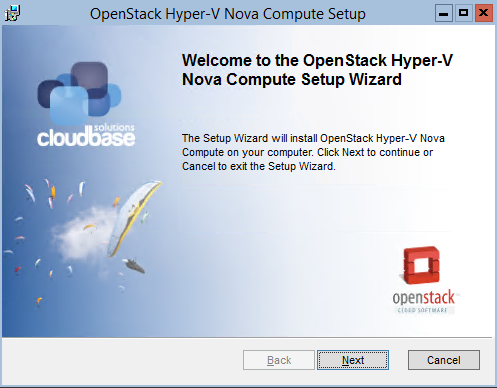 We did a lot of work this year on OpenStack and Hyper-V integration, with the result of bringing back Hyper-V in the Nova sources in time for the Folsom release. We are currently working on a lot of cool features to be released in time for Grizzly, so stay tuned! To begin, all you need is an installation of the Microsoft free Hyper-V Server 2008 R2 or 2012 or as an alternative Windows Server 2008 R2 or 2012 with the Hyper-V role enabled. If you want to see how Hyper-V works with OpenStack but you don’t have a server or PC on which to install it, well you can even run it on top of another hypervisor (for test purposes only, this is of course TOTALLY unsupported). As an example you can run it in a VM on top of VMWare Workstation 9, Fusion 5 or ESXi 5. We are going to install on Hyper-V only the OpenStack Compute role, so you’ll need to run the other required roles on separate hosts or VMs. If you don’t plan to deploy it in a production environment, I suggest you to create an Ubuntu Server 12.04 VM in Hyper-V or elsewhere with a DevStack deployment. Once your Hyper-V setup is done, you can copy our installer on a folder on the server and run it. This is the core feature of the package. It installs a dedicated Python environment, all required dependencies and a Windows service called nova-compute. By clicking on “Browse” it is possible to change the installation folder. Available on 2012 but not in 2008 R2, requires the host to be a member of a domain (can be even a Samba domain). This feature enables and configures Hyper-V “shared nothing” live migration. 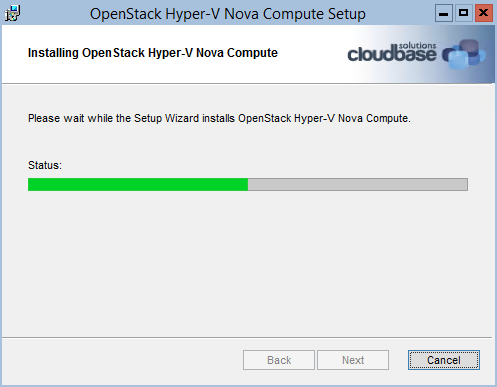 Beside KVM, Hyper-V is the only OpenStack hypervisor supporting it, with the additional advantage that thanks to this installer it’s unbelievably easy to setup! Enables and starts the Microsoft iSCSI initiator service, required for Cinder volume management. Creates an OpenStack command prompt shortcut. This is especially useful on Windows Server or on a workstation in order to have a ready made environment with the PATH and other environment variables properly set. FreeRDP is an amazing cross platform open source RDP client that works also with the Hyper-V RDP extensions required to connect to VM consoles. I blogged here in detail about it. The next steps are required to handle the service configurations and are displayed in function of the selected features. Nova compute requires one bridge (virtual switch in Hyper-V terms), which can be automatically created by the installer. 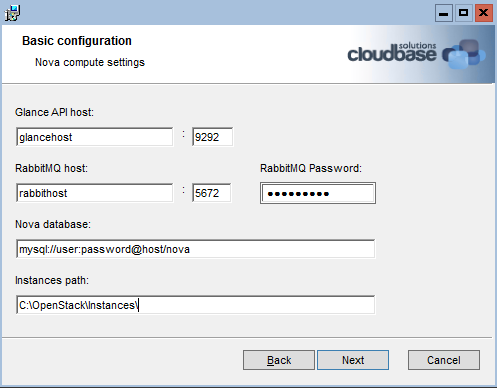 The basic configuration consists in providing the settings for the glance server address, RabbitMQ server address, Nova database and the path where the Nova compute driver will save the Hyper-V instances and Glance images. “Limit CPU features” is required when live migration is used between servers with different CPU architectures. When “Use CoW Images” is enabled, the Nova compute driver creates differencing disks based on the glance VHD images, instead of copying the entire image for each spawned instance. This leads to massively shorter instance deployment times. Here’s one of my favorite parts. Live migration can be configured here without having to use Microsoft Hyper-V Manager or Powershell. All you have to do is to choose the authentication type (we suggest Kerberos), the maximum number of parallel live migrations, and IP limitations if needed. 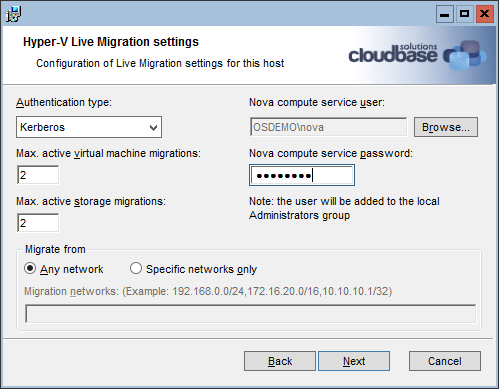 Please note also that live migration requires that the Nova Compute service runs with domain credentials. The selected domain user will be automatically added to the local administrators group. Once the setup is finished, you can always start it again to change / add / remove any feature. here’s also a quick FAQ for activities that you might need to perform on the Hyper-V server. How do I restart the iSCSI initiator service service? You can find here all the supported properties and a full example. How do I log the installer activity? How do I uninstall this package if I don’t have the MSI file? 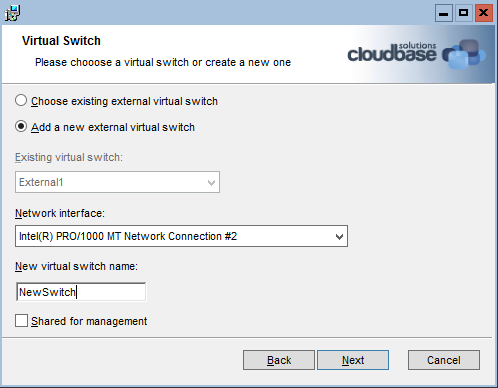 When using the installer on Windows 8 Enterprise I do not get any options for the Virtual Switch. I already have one configured, and it does not show in the list. Additionally, if I choose for the installer to create one the network interface list is also empty. Any thoughts how I should proceed? Thanks! I replicated your issue. On Windows 8 for the moment you need to start the installer from an elevated command prompt. We’re going to update the installer in order to always start elevated. the installer requires elevation on Windows 8. We just updated the MSI to show a warning in case of missing privileges. One of our goals was to make the process as easy as possible. I get error: “Invalid parameter” when trying to install on Windows Server 2012. Please Help. Same Error. Windows 2012 Standard with Hyper-V Role installed. MSI (c) (7C!4C) [01:36:27:259]: PROPERTY CHANGE: Adding CA_EXCEPTION property. Its value is ‘Invalid parameter ‘. Action ended 1:36:30: CheckLiveMigration. Return value 3. Action ended 1:36:31: FatalError. Return value 2. Action ended 1:36:31: INSTALL. Return value 3. I had this problem, I got the error with a Domain account, but not with the local administrator account. Once you have installed the plug-in you will need to restart the compute service. Qpid support is already provided by the Grizzly installer for Hyper-V and above, including the configuration lines in your comment. What version of the installer are you using? I am new to OpenStack on Hyper. I have successfully installed Folsom on my windows server 2012 test environment. Whenever I try to run instance I get following error on Hyper-v, Any clue? Looks like the image is not a valid VHD. Can you please post the command you executed to create the Glance image? I’d check also that the hash of the downloaded file is correct. make sure it is copied completely. Correct, Hyper-V on Grizzly requires VHD. For Havana we are supporting VHDX as well. 2013-09-03 00:49:35.078 4560 TRACE nova.openstack.common.rpc.amqp UnsupportedRpcVersion: Specified RPC version, 2.37, not supported by this endpoint. I can see that it says unsupported RPC version, but I don’t know how to fix it. I built my controller node on Ubuntu Precise using the devstack scripts. It means that the version of Nova running on the Hyper-V compute node differs from the version running on your controller. This applies only to the beta of course (Havana at the moment) typically when used with Devstack. Since the installer is generated automatically every night, make sure to use the latest one available. I setup this installer successfully and the hyper-v compute node connect to the controller node installed by the rdo. but the guest OS fail to get the IP address as expected. for example the expected is 192.168.32.2 : the fact is 169.x.x.x.x. I guess the config drive don’t work. but I don’t find any error message in compute.log , could you please help me to solve this problem? I don’t install quantum agent. the below is my nova.config on hyper-v. your support is very appreciated. Can you please provide some more context about your Quantum network configuration? Are you using VLANs? 2013-10-29 02:50:09.523 WARNING nova.conductor.api [req-37591869-a792-4caf-8ddf-6b7e5896fe29 None None] Timed out waiting for nova-conductor. Is it running? Or did this service start before nova-conductor? It’s always hard to troubleshoot an iassue without a complete picture. This could be related to either wrong RPC backebd settings (RabbitMQ / Qpid) or to a misconfigured stack_exchange. I’d start by comparing the options in the controller’s nova.conf with the Hyper-V compute node ones. 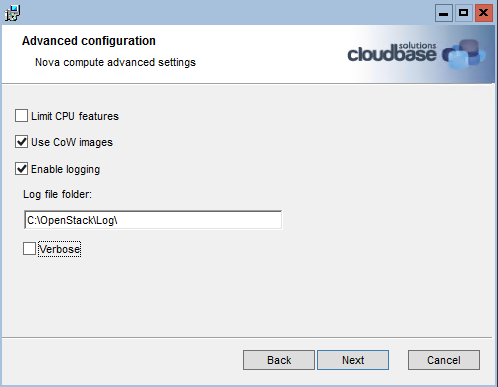 This is my first time to integrate cloudbase nova-compute in openstack. We are installing in a multi-node setup consists of controller node, network node and the Hyper-v Server. First, I would like to ask about ceilometer on nova-compute. ceilometer-agent-compute has to be installed in nova-compute node. If my nova-compute node is in Hyper-V, Do I still need to do it? or ceilometer-agent-compute is already installed on Cloudbase nova-compute. 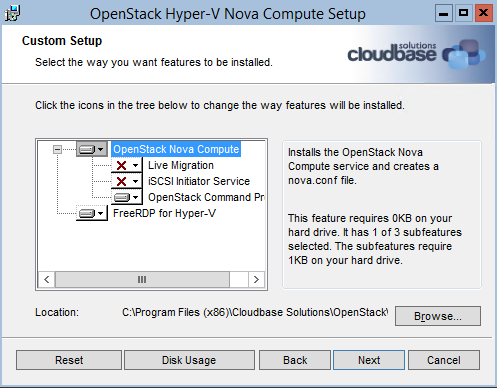 Second, If I going to use cloudbase hyper-v nova-compute as openstack nova-compute, How many nova-computes can be created in 1 Hyper-v server? Thanks a lot, nova-compute in Hyper-v did a very unique and great things. The ceilometer compute agent gets installed starting with the Havana version of the installer, no need to install it manually. On your next question, about how many nova-compute can be created in 1 Hyper-v server, the answer is that each Hyper-V server is one compute node. I’m surprise with your fast feedback. I could get the nova-compute start successfully, by pointing it to controller’s rabitmq. Earlier i was using rabitmq on hyper-v itself, that’s why there was an error. It is supposed to on controller node. Now, I created a CirrOS test image in glance(on controller), while booting that image using “$nova boot …args” command, its Task Status remains in “Spawning” for some time then goes in ERROR state(from $nova list). I am running latest devstack code base on controller. I tried running with Havana and Grizzly hyper-v nova msi as well, getting the same error on both cases. I am not able to understand what is the version mismatch ? nova or vm instance or glance version ? Now after restart of nova-compute its throwing same error, not even able to start itself. Any pointers will be appreciated . On the Hyper-V compute nodes you should install only nova-compute, the Neutron Hyper-V agent and optionally the Ceilometer compute agent. beside that, the components that you use MUST have the same version on the entire stack (e.g. Havana 2013.2 or Grizzly 2013.1.3, etc). When attempting to install, I get a “invalid parameter” then the installer closes. Any idaes? Hi, what version are you using, Havana or Icehouse (beta)? Post it on paste.openstack.org and post the link here?